Keeping the grass in your yard mowed and removing leaf litter and brush from the edges of your property (especially if it borders natural areas). Creating a natural physical separation between your yard and wooded areas using a border of wood chips or gravel. Cleaning up areas under and around bird feeders to reduce the attraction of small critters such as mice that help transport ticks and are necessary hosts for ticks to complete their life cycle. Placing children’s play structures away from wooded areas. When weather permits, wear long sleeves and long pants and closed-toe shoes to ensure your skin is covered. Wear light coloured clothing as it allows you to spot ticks that may have crawled on you. Tuck pants into socks to prevent ticks from crawling up your legs if you are going to be hiking through the bush. Insect repellents containing DEET or Icaridin can be sprayed on clothing or skin to repel ticks (be sure to follow the manufacturer’s instructions for safe use). Stay on the groomed part of trails where there is no vegetation for ticks to hide on. 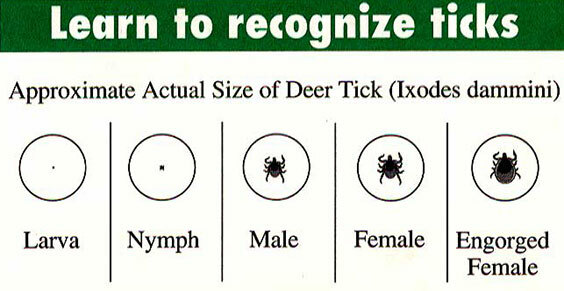 Do a complete tick check of your entire body when you return from the outdoors and have someone check the back side of you. 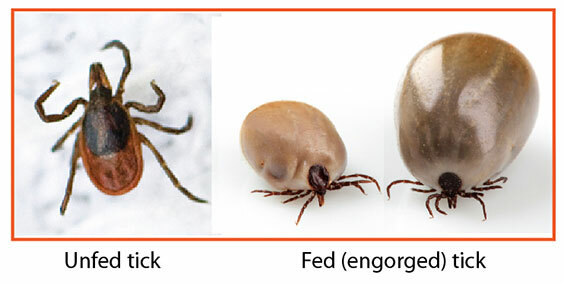 A quick shower may help wash away ticks that have not yet attached. Outdoor wear can be placed in the drier for a few minutes to kill ticks. Speak to your vet about ways to protect your pets. Remove the tick using tweezers or a tick puller, by grasping the tick by the head as close to your skin as possible. Pull on it firmly, but gently and straight out. Examine the tick to see if it is flat or fat. 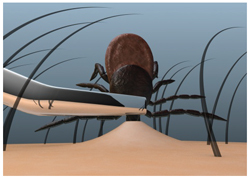 If it is flat is has likely been on you less than 24 hours and it is unlikely that if it was a positive tick that it would transmit the bacteria. 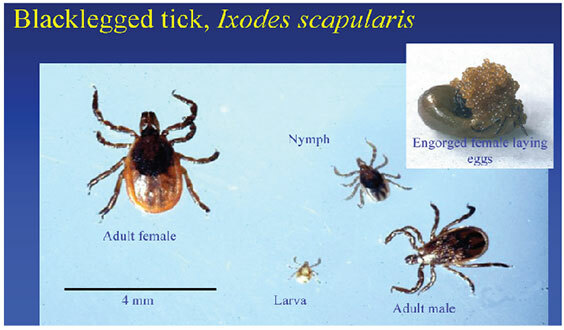 If the tick is fat it is likely that it has been attached to you and feeding for more than 24 hours and you may be at a higher risk of getting Lyme disease so consult with your health care provider. Clean and disinfect the site of the bite. 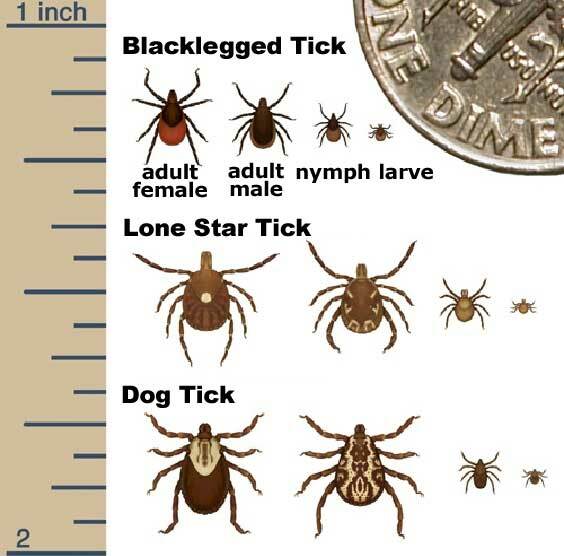 Make a note of the date you removed the tick – early symptoms of Lyme disease appear from 3 days to 30 days following the tick bite and may include a red rash, a bulls-eye rash, fever, headache, fatigue, muscle and joint pain. These early symptoms may disappear without treatment; however the disease can move into the next stage where it may be more difficult to treat. How Do I Reduce Numbers of Mosquitoes Around My Home? Remove standing water from things that can collect water like bird baths, old tires, flower pot saucers, gutters, children’s toys. Keep decorative ponds from becoming stagnant. Keep bushes and shrubs trimmed. Keep compost piles turned regularly. Keep ditches free of debris so they can drain properly. Keep pools and wading pools chlorinated. Ensure windows and doors are screened to keep mosquitoes out. Avoid outdoor activities in the early morning and evening when mosquitoes are most active and if you have to be out cover up and use insect repellent. Wear long-sleeved shirts, long pants and socks when outdoors during these active times. Use bug nets over strollers and playpens and screened tents when spending time outdoors. Apply insect repellent to any exposed skin, sparingly. The concentration of DEET should be no greater than 30% for adults and no greater than 10% for children. Carefully read and follow manufacturer’s directions for use. Do not apply repellent to children’s hands, or near any areas of mucous membrane such as the eyes or mouth. Consider spraying clothing with repellents containing permethrin, as mosquitoes easily bite through thin clothing such as cotton t-shirts. Special note when packing for camp: Check to see if aerosol sprays are allowed at your child’s camp. If sprays are not allowed, make sure you pack an insect repellent that can be applied by pump or by hand.